If you have any questions or want to enquire about dates, use our form to contact Tivy Jones or see their website for more information. The Black Mountains are the backdrop to your Herefordshire retreat: this converted bakehouse has all a couple need to escape city life. Inside, tones are neutral, with wheat coloured carpets and soft fabrics in the living room to set off the dark beams above, and a wood-burner stacked with logs. The kitchen isn’t huge but it is well-equipped (and you’ll find some generous basics along with handmade chocolates and local Welsh cakes), so pad through to the conservatory with a coffee, or step out to the sunny garden – both are great birdwatching spots. Two meadows lie just beyond, the start of many footpaths that criss-cross the countryside; the river Monnow meanders by too. The energetic Jones’ use the old mill owner’s house at weekends but otherwise the cottage stands in peaceful seclusion. After a day spent in bookish Hay-on-Wye, a windswept trek on Offa’s Dyke or a drink in the local pub you can head upstairs and collapse into your big zip-link double, with its fresh linen and pretty view to the garden. The award-winning village shop can sell you a fishing licence and there’s plenty of space for storing bikes. We had a lovely relaxing autumn week in this cosy cottage with everything we needed ! Tivy and steve are perfect hosts and made us very welcome ! Fresh flowers , endless supply of logs for the stove and a lovely welcome pack were much appreciated! Highly recommend this sweet cottage in beautiful grounds any time of the year ! We had a lovely relaxing stay at Monnow river cottage: it was perfect for a cosy autumn week with everything we needed to chill out ! Tivy was helpful and thoughtful and we cannot recommend the cottage highly enough ! This is a magical place. This gorgeous cottage nestles amongst gardens tumbling with flowers and is sorrounded by trees and fields. The lovely river Monnow.is only a few steps from the door and you are free to roam to your hearts comtent. The cottage itself is a gem and the owners Tivy and Steve feel like friends as soon as you meet them. We will certainly be back. It would be hard to find a more lovely cottage to rent in such a beautiful part of the country. The cottage ,gardens and surroundings are all well cared for and welcoming.Well equipped, felt as if everything had been thought of to create somewhere you were happy to return to after a days cycling ,walking or exploring .Lovely touches -vases of freshly picked garden flowers,hamper,towels and toiletries.A very efficient log burner and stacks of logs.Plenty of space for two and comfy bed with beautiful bed linen. Cannot imagine anybody being disappointed with a stay here.It was hard to leave. What a wonderful week at Monnow River Cottage. The cottage was everything we hoped for. The beautiful gardens, steam, orchard etc.made the location quite magical. The welcome cider and welsh cakes were much appreciated as were the rooms full of beautiful cut flowers, sweet peas, verbena, etc. The hard work Tivy and Steve put in to maintain the cottage and its surroundings is amazing, including restoring the old mill and growing heritage apples. The local shop/post office is just a few minutes walk away and is very well stocked with everything you need. We certainly hope to return. We had a lovely week at Monnow River Cottage. The cottage was very clean, comfortable and had everything we needed. The garden was beautiful with the flowers in full bloom. There are plenty of walks in the area and places to visit. Thank you Tivy & Steve for making us feel very welcome to your fantastic country retreat. A return visit for us and another really good break. The estate was in full bloom, from veg garden to hay meadows so we usually fitted in a daily wander around. The peaceful setting really is outstanding and we particularly enjoy being able to do a few circular walks from the door. The most obvious (and longest) is up Offa's Dyke and on a fine day the views are amazing, and there is the option to drop down into the neighbouring Llanthony valley with its Priory ruins. There are walks books and a map in the cottage. It's a wonderful place to stay. This is a lovely secluded cottage next to the Monnow River surrounded with groomed meadows full of wild flowers.There are walks with bench seats at various viewpoints for you to see the fish jumping or, if you’re lucky, the odd Kingfisher or even otter. All the rooms are well appointed and have all the comforts and facilities you require not to mention a large Garden with table and chairs. Tivy and Steve are perfect hosts and are full of enthusiasm for the future restoration of the mill and creating an environment to encourage the local wildlife. I hope you enjoy your stay as much as we did. We returned to Monnow River Cottage as we had such a lovely holiday last year. Tivy and Steve are very welcoming and the cottage is beautifully presented. It is extremely peaceful and the lovely gardens make dining outside very relaxing. The welcome pack and fresh flowers throughout are really appreciated. We will return next year. Very well and thoughtfully appointed cottage. Fresh flowers in every room. Sunlit conservatory offers extra relaxing space flowing out to garden available to guests. Log fire much appreciated. Every comfort has been attended to. Warm and attentive welcome. Beautiful location offering peace and tranquillity with extensive meadows and river within the grounds. Monnow River Cottage was probably the best holiday home we have enjoyed. Tivy and Steve have created such a beautiful home within a truly magical setting. The garden, the river, the orchard and a stunning watermil- with the Black Mountains in view too. The cottage has everything and more - with a generous welcome basket of food provided fresh flowers in every room, fluffy soft towels and home grown vegetables. It was exceptionally difficult to leave so we will have to return! This is an outstanding place to stay for tranquillity, and a beautiful setting if you want restorative peace and quiet and the great outdoors. No traffic jams and no gatherings at peaks or trig points, although the local footpaths are well signed and described in guides. The cottage itself is small and charming. We felt it was not just a base but a great place to be. It has its own large adjacent garden out the back and you are free to go anywhere- the large orchard, the fenced veg and flower garden, meadows, along the riverside- no 'Private' signs. All this, and a sincerely warm welcome. Very comfortable with tasteful design (excellent conservatory) in a beautifully located property around which the river Monnow runs with tree-lined banks and meadows with well cared-for natural vegetation and wildlife. The ridge of the Black Mountains about 2 miles to the west forms a beautiful backdrop and the wooded hills of Herefordshire lie in view to the east. An excellent provisions shop is 5 minutes walk along the country lane. Good eating places in the locality. The charming hosts, Steve and Tivy, are warm and generous. Rural beauty and peace in abundance for those who appreciate it. Beautiful cottage in grounds of a Mill House but feels very secluded ,with own garden spaces. Extremely peaceful. Excellent village shop and pub - both walkable. Remarkable churches nearby,fine walks, top shopping in Hay on Wye,Crickhowell and Abergavenny, & many very good ( pub) restaurants locally . This cottage is set in peaceful and beautiful gardens which we were able to take full advantage of. Many of our meals were taken outside and the beautiful surroundings were enhanced with alot of birdlife. We also spent time in the conservatory and enjoyed watching birds on the feeder just outside. The facilities are very good, and the bed is extreemly comfortable and large. A really good bed is top of our list when looking for holiday cottages. The welcome pack and fresh flowers that were provided were a thoughtful extra. We hope to revisit. We spent a great week at Monnow River Cottage. It is a lovely well equipped and comfortable cottage in a nice setting next to the old mill with plenty of walks and cycles on the doorstep. Haye and Abergavenny close by for other attractions. Hosts Tivy and Steve were very friendly and helpful and nothing seemed too much bother. Strongly recommended. Wonderful spot for quiet and exploring. Thoroughly recommend it. We had a wonderful stay at Monnow River Cottage. The decor is stylish and cosy with a lovely wood burning stove. Fantastic walks nearby and a very peaceful location. Warm welcome and fantastic local hamper of goodies!! 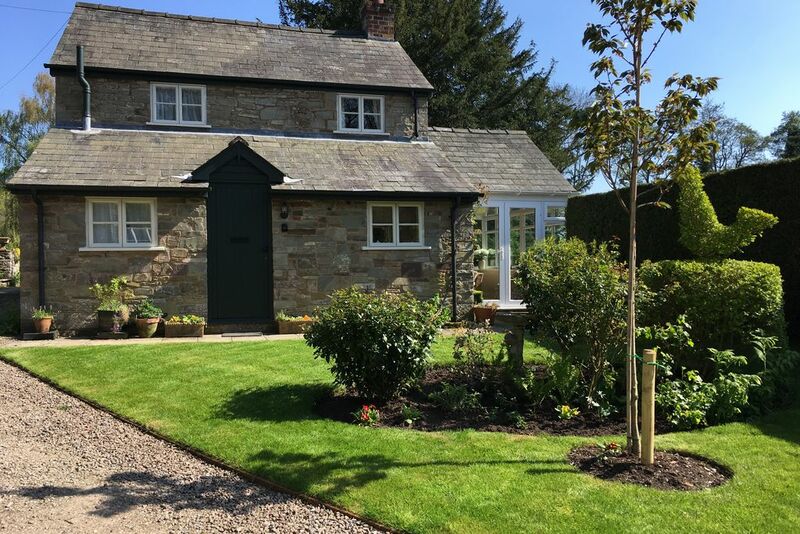 We love everything about this cottage and location; it's set in an idyllic rural location in private grounds and surrounded by beautiful countryside and abundant wildlife. The hosts were very helpful, provided us with a hamper on arrival and ensured to make our stay as enjoyable as possible. Living in London, it's hard to imagine that places like this really exist. the cottage, owners house and ancient mill lie in a perfect position, surrounded by gentle hills, wild flower meadows and a beautiful curving river. It's a bird watcher's paradise - within a few hours we'd seen woodpeckers, a nuthatch, bullfinch and even a kingfisher! The meadows when we were there were probably at their very best, full of buttercups, clover and early orchids. close by the shop sells local produce and the pub serves a range of very naughty homemade pies. The cottage's bed is sublime. Heaven. Cornewall Arms. Wonderfully old-fashioned tiny, unspoilt pub of great character. Of great interest to pub historians. 15 min walk. Award winning Hopes village shop and Post Office. Full of local wine and home produce, they’ll have everything you need. Wonderful walking in Offa’s Dyke National Park & The Black Mountains. Fishing on the River Monnow, you coluld be lucky and see kingfishers and otters. Fishing licence obtained from the village shop. 5min.